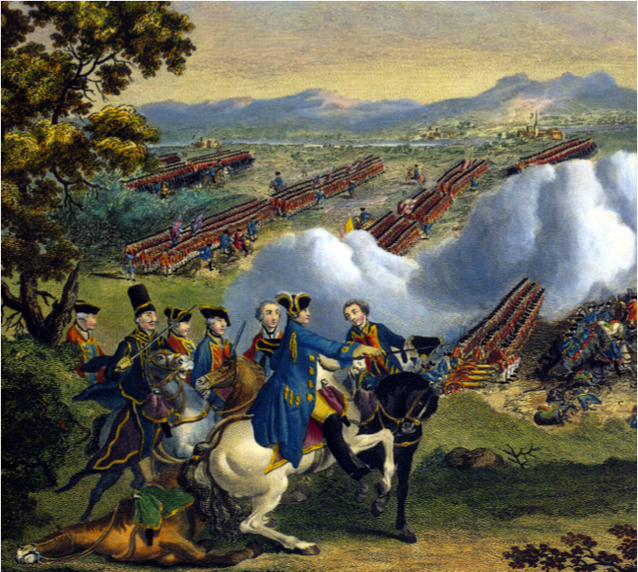 In 1763, the Seven Year's War came to an end. This war was known as the French and Indian War in North America, but it was truly a global war. In the region of Hesse, where many Volga German families originated, homes, farms and town had been decimated during the fighting. This so called "first world war" resulted in 900,000 to 1,400,000 deaths. The ruling houses of the Holy Roman Empire of the German Nation were divided in this struggle and their subjects were often forced to serve in the military and to pay higher taxes to support the war. Many of the men were coerced into military conscription to serve as mercenaries fighting in other nation's wars. In later years, some of the Hessian soldiers were brought to North America to fight for the British in the Revolutionary War. Battle scene from the Seven Year's War. Source: Wikimedia Commons. After the Seven Year's War ended, the population in central Europe began to slowly recover. Farm land and food was soon in short supply. Many families without their own land lived on the edge and had little prospect of a stable life. This fact coupled with poor harvests in the early 1760's drove up food prices and shortages became prevalent. The Seven Year’s War was fought on religious grounds and the winners determined what faith their subjects would follow. Of course, this did not always match the religious practice that the people themselves preferred to follow. All in all, it was a very difficult time for many people living in Central Europe during the 1760's, especially the landless lower classes. As is natural, many people wanted to find a better life even if that meant leaving their homeland. According to Ben Franklin, there were around 100,000 Germans living in Pennsylvania by 1766. At this same time, Russia was expanding its empire to the south after winning territory from the Ottoman Empire. Catherine II (Catherine the Great) and her government wanted to solidify this region as Russian territory and she needed settlers who could turn the land into productive farms and stabilize this region of the empire. 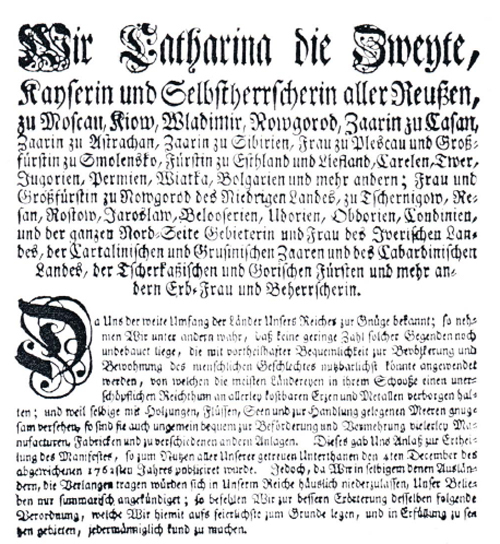 Catherine was born in Stettin, Pomerania, Prussia as Sophie Friederike Auguste von Anhalt-Zerbst-Dornburg. Catherine was raised in an environment of German culture and traditions. She became Empress of Russia in July 1762 following a coup d'état and the assassination of her husband, Peter III, at the end of the Seven Year's War. Catherine's Manifesto, issued in 1763, encouraging settlement in Russia could not have come at a better time for many people who were landless and had been devastated through years of war. The Manifesto offered paid travel costs, free land, exemption from taxes, freedom of religion and language, self-government and exemption from military service in perpetuity. This was an unprecedented offer to entice immigration. 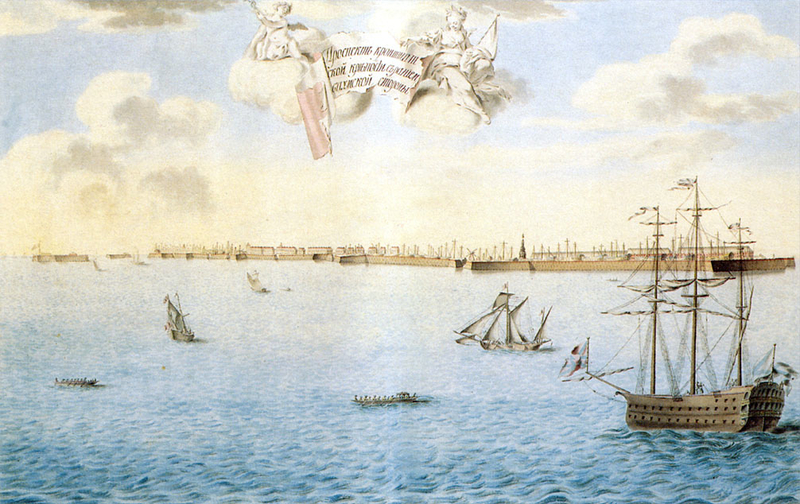 The island fortress of Kronstadt in 1780. The Volga German colonists first arrived at the point in Russia from 1764 to 1766. Russian recruiters carried the Manifesto throughout the German speaking parts of Europe, luring thousands with its promises of a better life in a far away land. Over 30,000 people would choose to become colonists and start a new life on the Russian frontier. They settled in 104 colonies along the lower Volga River near the frontier town of Saratov. Over time, these colonists would evolve into a distinct ethnic group known as the Wolgadeutschen or Volga Germans.